Tropico 6 is a construction, management and political simulation game in the Tropico series, developed by Limbic Entertainment, published by Kalypso Media, and announced at E3 2017. Originally intended for a 2018 release, Tropico 6 was set for release on Microsoft Windows, macOS and Linux on 25 January 2019, with a release on consoles scheduled for the summer of 2019. However, on 8 January 2019, Kalypso managing director Simon Hellwig announced that the release would be delayed to 29 March, while rewarding those who pre-ordered prior to 10 January with the first DLC, slated for a summer release, free of charge. As in the other games in the series, the player assumes the role of "El Presidente", the leader of the Caribbean island nation of Tropico. Similarly to Tropico 5, there are four eras: The Colonial era, the World Wars era, the Cold War era, and the modern era. 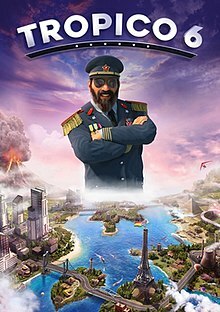 Unlike previous games in the series, where Tropico consisted of only one island, Tropico 6 allows players to build on an archipelago of smaller islands, allowing players to build bridges (in the World Wars era and later) from their starting island to the other islands in the chain. According to senior content designer Johannes Pfeiffer, Tropico 6 will have "fully simulated" citizens, where the actions of El Presidente's government towards the citizenry could have an effect on productivity, and possibly even result in a revolt. In addition to customizing their own El Presidente (as either male or female), players can also customize the presidential palace. The game received a "generally favorable" rating from critics on the aggregating review website Metacritic; the PC version received a rating of 78/100 based on 43 reviews, with a user score of 7.9 with 35 ratings. ^ Makuch, Eddie (June 12, 2017). "E3 2017: Tropico 6 Revealed For PS4, Xbox One, And PC With First Trailer". GameSpot. Retrieved June 14, 2017. ^ Phillips, Tom (16 August 2018). "Tropico 6 will now arrive in January 2019". Eurogamer. Retrieved 4 December 2018. ^ "Open Letter to the Tropico Community". Kalypso Blog. 8 January 2019. Retrieved 8 January 2019. ^ Good, Owen S. (30 September 2018). "Tropico 6: A familiar getaway that's anything but a vacation". Polygon. Retrieved 4 December 2018. ^ Good, Owen S. (15 April 2018). "Tropico 6 preview: 'Fully simulated' Tropicans complicate El Presidente's job". Polygon. Retrieved 4 December 2018. ^ Boudreau, Ian (26 August 2018). "Tropico 6 is a 'greatest hits' of El Presidente's questionable career". PCGamesN. Retrieved 4 December 2018. This page was last edited on 25 April 2019, at 18:13 (UTC).